Pictures of interesting bowls and bins made from recycled magazines are popping up all over the Internet, but very few have useful accompanying instructions. After some experimentation, and lots of glue, I discovered a process for making uniform paper coils and an attractive bowl. 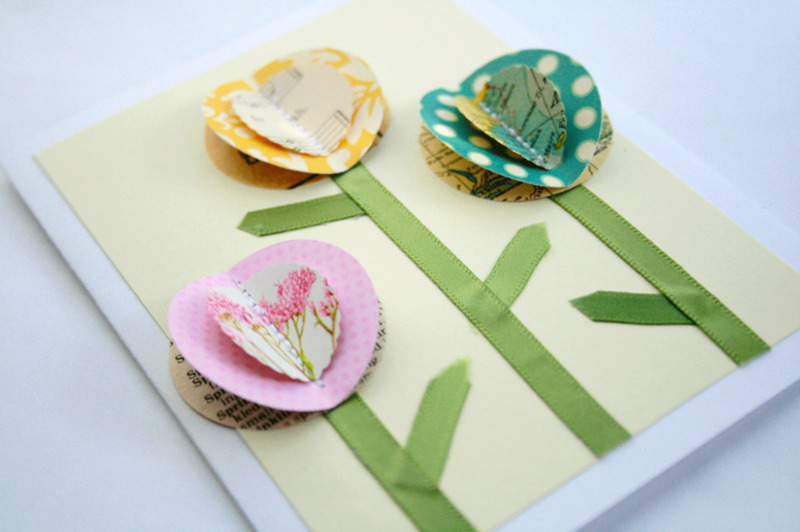 For this project, you can use any type of recycled paper. 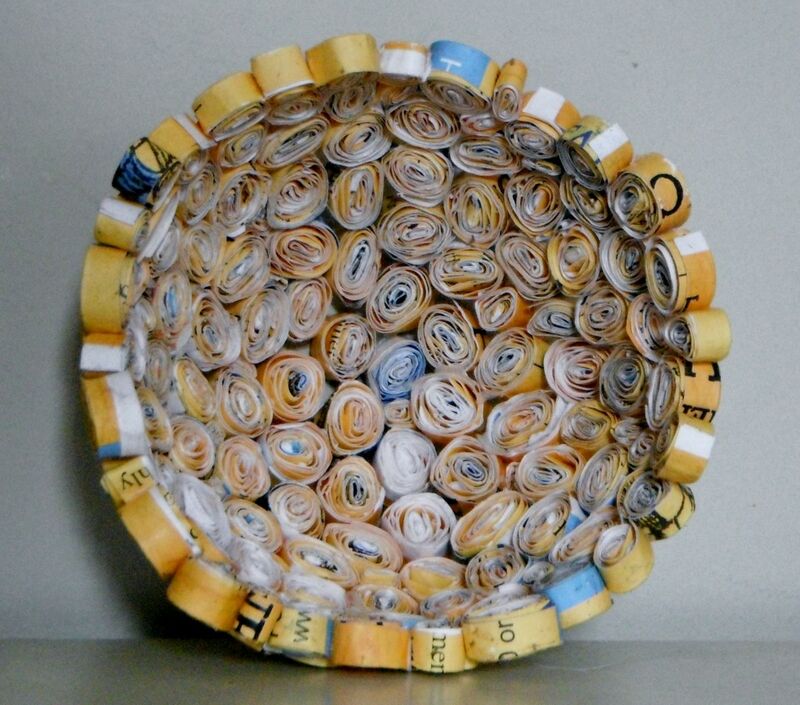 Magazines, catalogs, junk mail, and left over fliers are all great sources of paper to recycle into a coiled bowl. I used a stack of out of date program schedules from work because I liked the uniform color of the pages, but a multicolored bowl would be cute, too. First, you must cut the magazine pages in strips. These strips need to be uniformly wide and have straight sides if you want your finished product to look like a bowl instead of a mess. 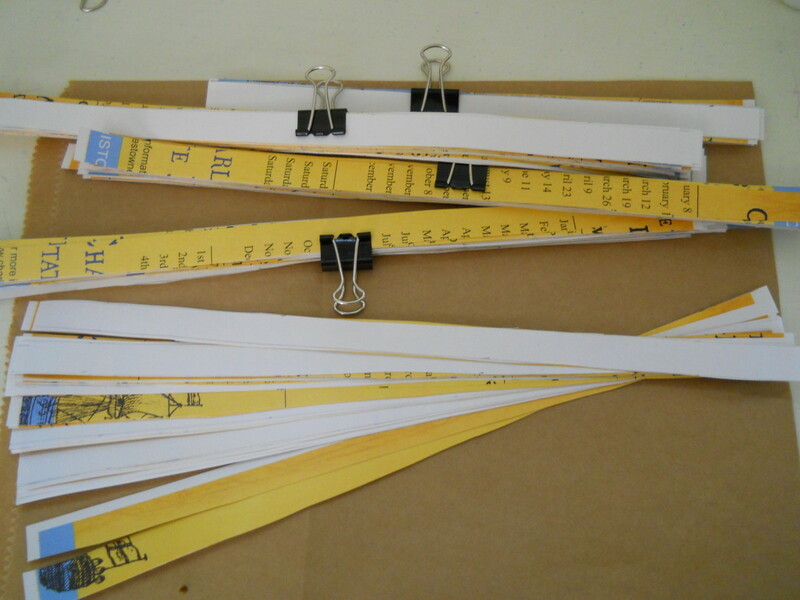 If you have access to a paper cutter, you can quickly cut 1/4" strips. If not, use a ruler to carefully mark off the page in 1/4" increments. 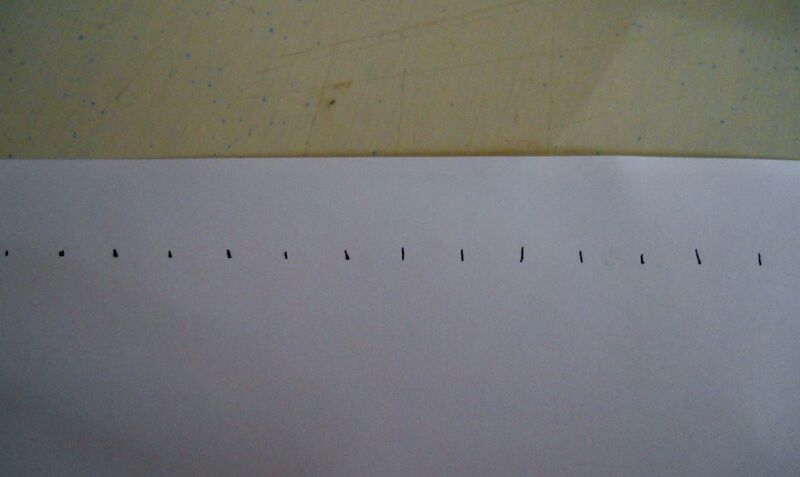 To ensure a straight line, make marks every quarter of an inch along the bottom, middle, and top of the page. 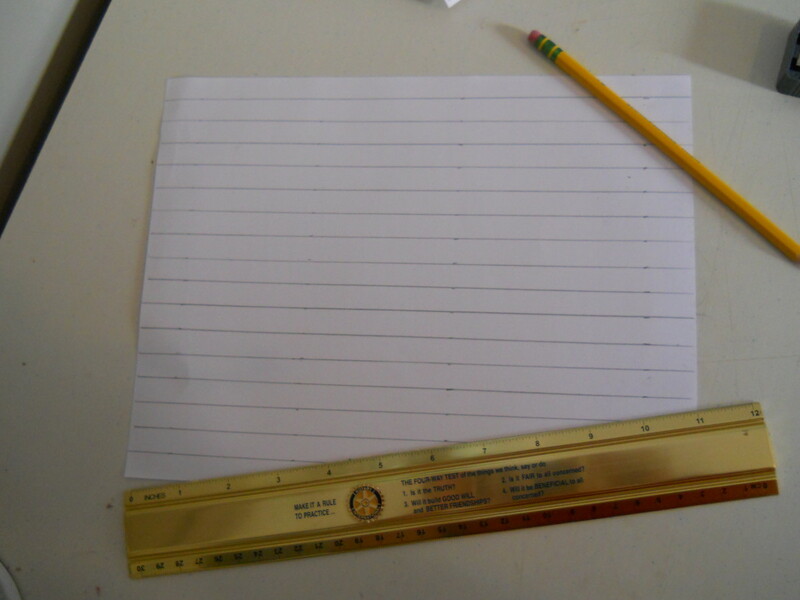 Then, use the ruler to draw lines along the marks so you create a series of parallel lines 1/4" apart. If you would like to make the hand cutting process a little faster, take your lined sheet and clamp it to about five other sheets, as shown in the picture. I used about half a box of tiny binder clips to keep the pages from slipping while I cut, and then cut along the top page's lines. If you attempt to simply hold the sheets in place while cutting, you will end up with uneven strips because the pages will slip. 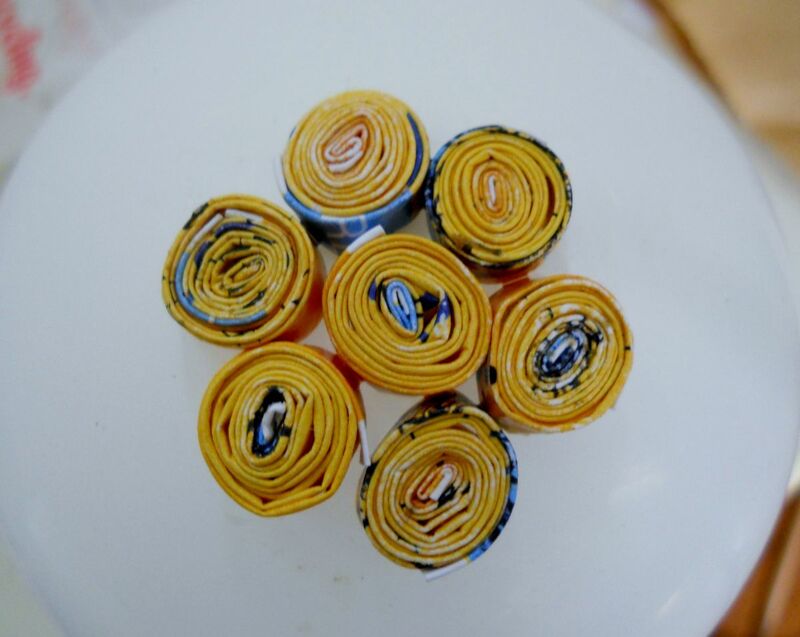 After you have made a few dozen paper strips, you can begin forming coils. It does not matter if you don't have enough strips for the entire bowl because you need to let it dry in stages so the coils do not simply fall off. Before opening your glue, blow up and tie off a balloon. I think small round balloons work best, but use whatever shape or size you want for your project - it's yours! Then, place the balloon, tied side down, on top of a glass. 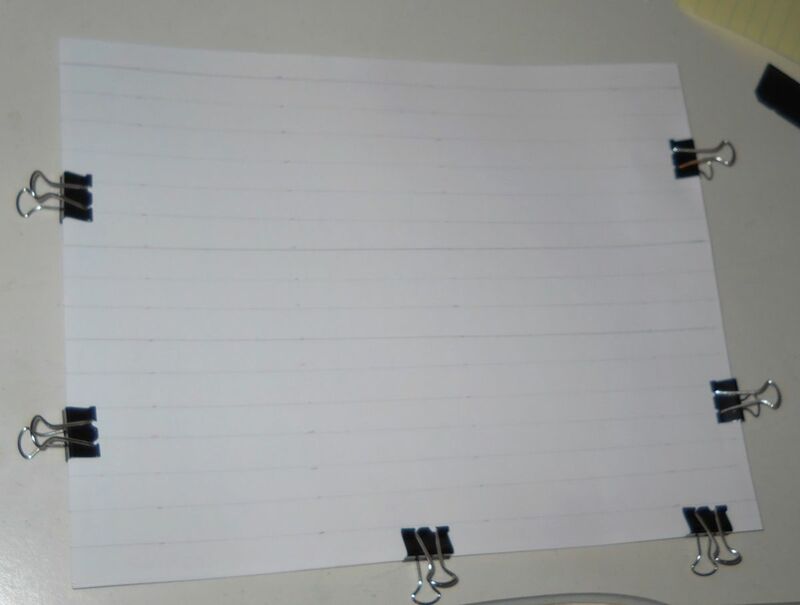 Gluing the paper strips can get a bit messy, so before your proceed, you should protect your work surface with an old grocery bag, or something similar. 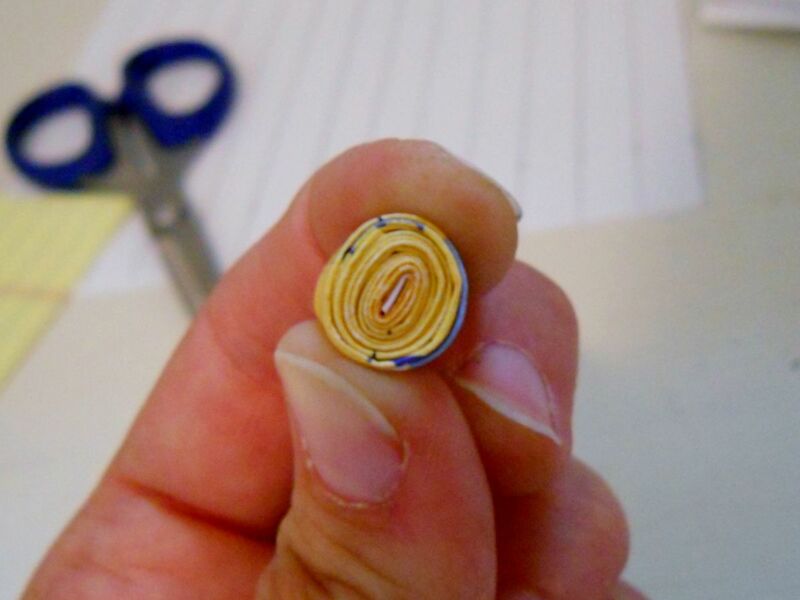 Then, place a line of white glue down the center of the "wrong side" of a paper strip and spread it evening along the surface using a paint brush or finger. If you are using double-sided magazine pages, you don't need to worry about a right and wrong side, unless you prefer the colors on a side. 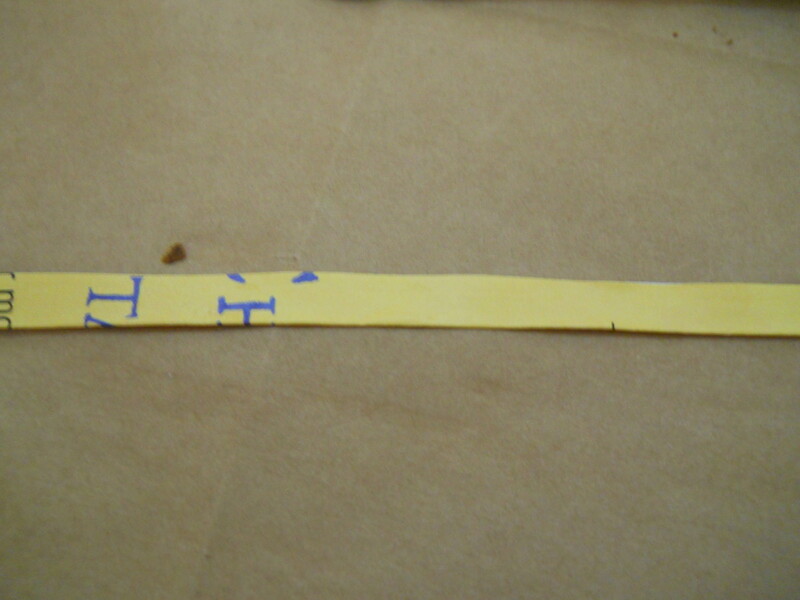 Then, carefully fold the strip in half, wrong sides together, to form a thinner, but equally long, strip. 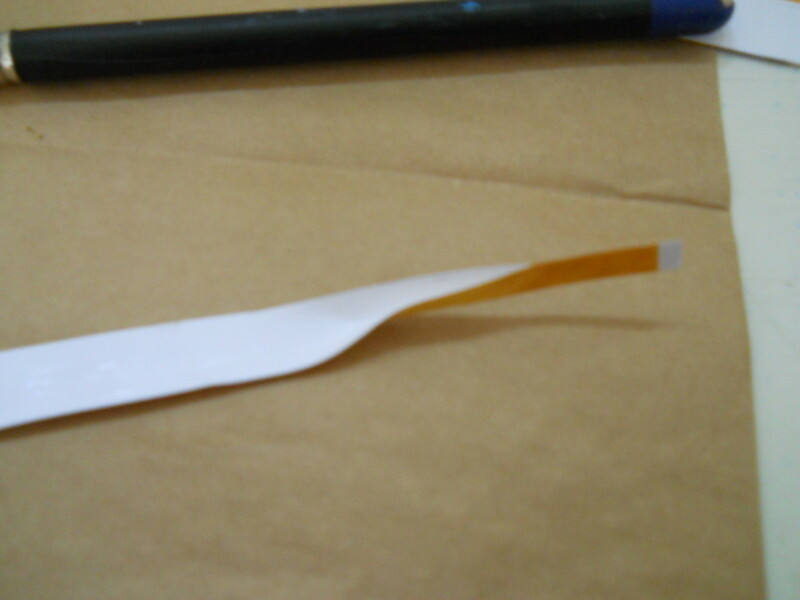 Apply another line of glue along this new strip and carefully form it in to a tight coil. 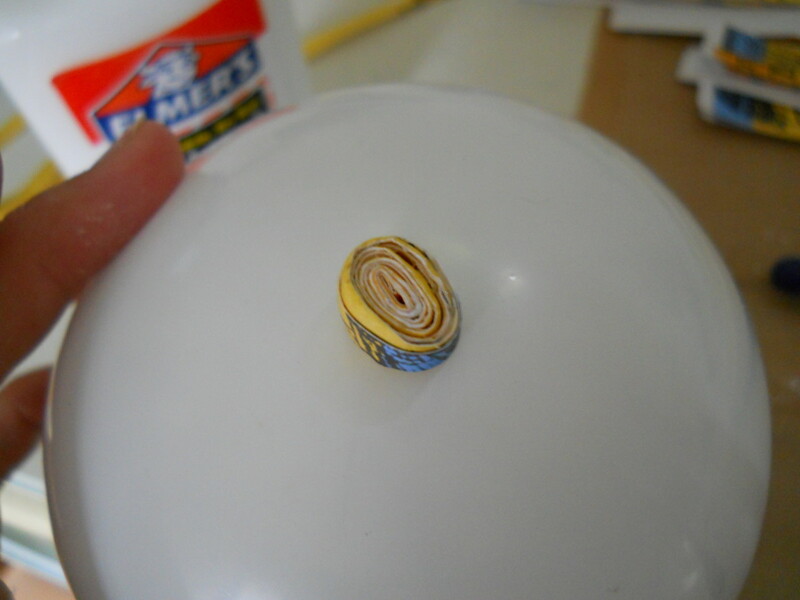 Place this coil on the top of your balloon as the center of your bowl-to-be. I like the finished appearance created by placing the folded edge out, so I made sure all of my coils were placed with this neat edge showing. All that remains is gluing additional coils around your central coil until your bowl is complete. Unfortunately, this is a little easier said than done. The process is not difficult, it simply takes time - and a willingness to get glue on your fingers! After experimenting with super glue and white glue, I discovered that white glue works better for attaching the coils, you just have to stop every row or two and let the glue dry. Even though it slowed the drying process, I added a small amount of water to my now partially-empty white glue bottle. The thinner glue had an easier time seeping down into the cracks and gaps, but you can use full-strength glue, if you wish. You can use these drying periods to cut additional paper strips. Having an idea of how much area strips cover can keep you from devoting hours and hours to cutting far more strips than you need, too. After the basic shell of the the bowl is dry, you may notice little gaps between the coils. To fill these gaps, cut some of your strips into shorter lengths and make smaller coils to fill in the empty spaces. You can do this while fabricating the main body of the bowl, but I found trying to incorporate small coils from the beginning meant I had to stop and wait for glue to dry even more frequently. If you love the look but want to use the bowl for liquids, you can purchase plastic bowls covered with paper spirals. After filling in any gaps and waiting for the glue to dry, remove the balloon. I have seen people suggesting simply popping the balloon, but I was afraid the might leave me with clinging fragments of balloon glued to the bowl's interior. Instead, I suggest carefully rocking the balloon back and forth, cracking the glue. You should be able to remove the balloon, or pop it without fear of clingers. There you have it! 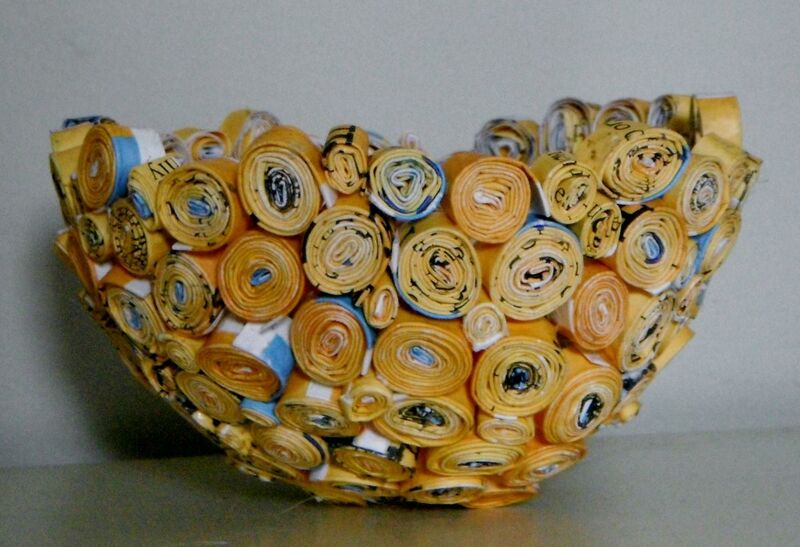 You just created your very own recycled magazine bowl. Now that you understand the process, why not move on to bigger bowls, or maybe even an inventive trash can or storage bin? If you love recycled crafts, I highly recommend Found, Free, and Flea. It's full of neat ideas and has fantastic pictures, too. When I grow up, I hope I can be as inventive as this book's authors! Wow - never seen anything like this before. I've done a lot of papier mache artwork, but this is a great idea. Can't wait to try it out. Great Hub. 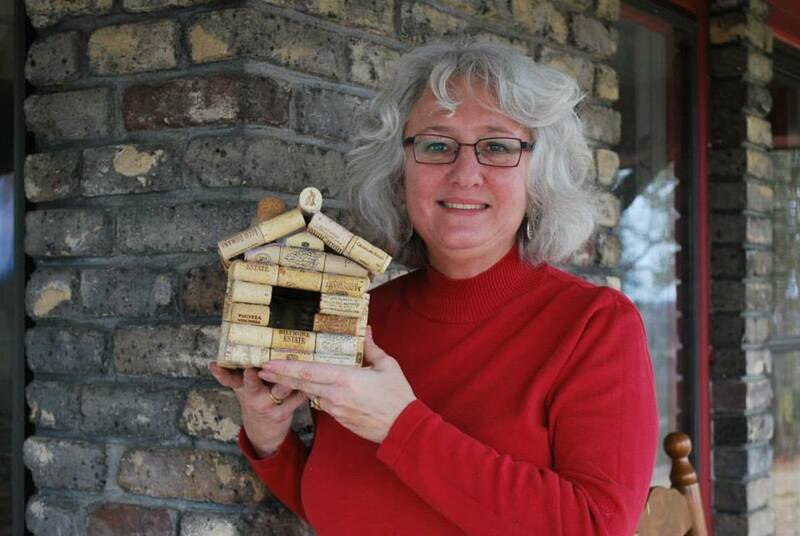 It takes a little bit, but it's a very low cost project that is a lot of fun! Wow, you are incredibly creative! Thank you, Kevin, and I hope you have fun, Aplethora! awesome. I will let you know. I already have the directions written out, along with a few other crafty projects to do with the kids this summer. Just waiting for school to get out and then we're all over it!! A very unique thought of creating such a wonderful piece of artwork. I loved it. The pictures included in the hub will help making such a bowl easily. Great and useful hub! Post them here on my page or like on your own blog? I'm happy for you to post results of using my tutorial - if you can just link back to here as the tutorial source. If you let me know where you post it, I'll try to add a link to you, too. I am new to Hub Pages. Is there an appropriate way to take pictures of the things we made from following the directions on your site and post them? Does it work like that here - or - ? Hooray! I hope everyone has a great time and you find some colorful stuff to upcycle! 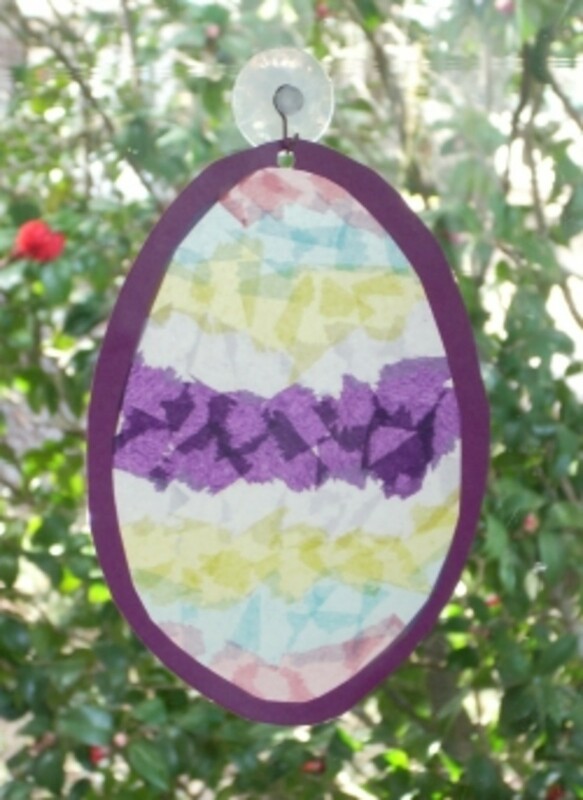 What a FUN project to do with the kids at home this summer! I am looking forward to it. Thank you. Voted Awesome. Fun, useful, awesome, cute and helpful info Natasha! I wish I'd had my current camera when I made this hub! The pictures would have been so much better. Oh, well. It was fun to make and the materials were practically free! Thanks for stopping in and I'm glad you enjoyed it. Great instructions. 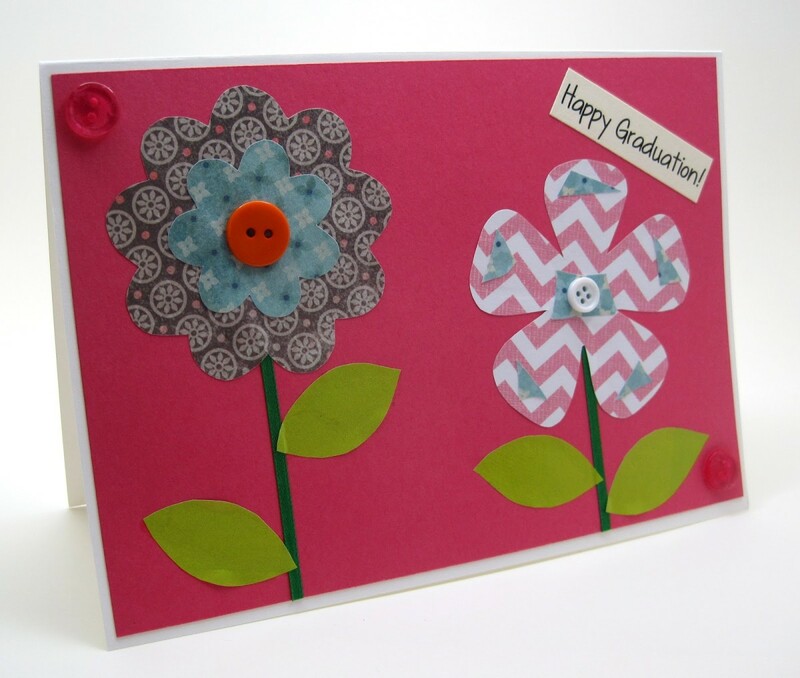 This looks like a fun craft with do with a tween or teen. Thank you so much! I appreciate the votes and am glad you found it useful. Thank you, Heather Says! Glad you liked it. Thanks so much! I am glad you find the instructions understandable. Thanks for stopping by! Oh, what fun! I've done a few magazine crafts- never a bowl (yet). Your explanation was well organized. Thanks for sharing. You are just too clever. What a lovely bowl and it is so cheap to make. You are amazing. I am voting up and sharing.. I think I know what you're talking about - it's like how you make a paper bead. I agree, that doesn't show a cut edge and coils that big work well for larger containers, like a small trash can. It might look a little goofy on something so small! Thanks for sharing your tip for anyone wanting to make a larger project. 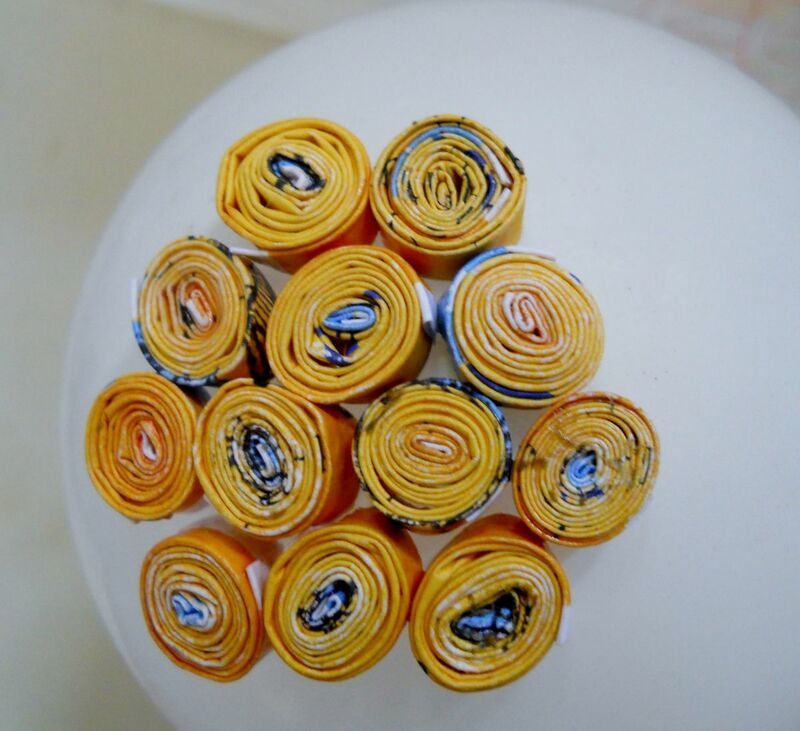 I am making one of these bowls, BUT my way of rolling the paper is way different and I would say the coils come up thicker, a bit more sturdy and look like good quality. I use one whole page per coil, sometimes 2 or 3 if I want the coil to be bigger. I'm making 3 sizes. Each page I roll it up from corner to corner to get a stick with pointy ends. There's no cutting, and then roll it up again into the coil. When you see the coil you don't see the edge of the magazine page, you see more like a rounded edge. Just thought I'd share the tip. Thank you! 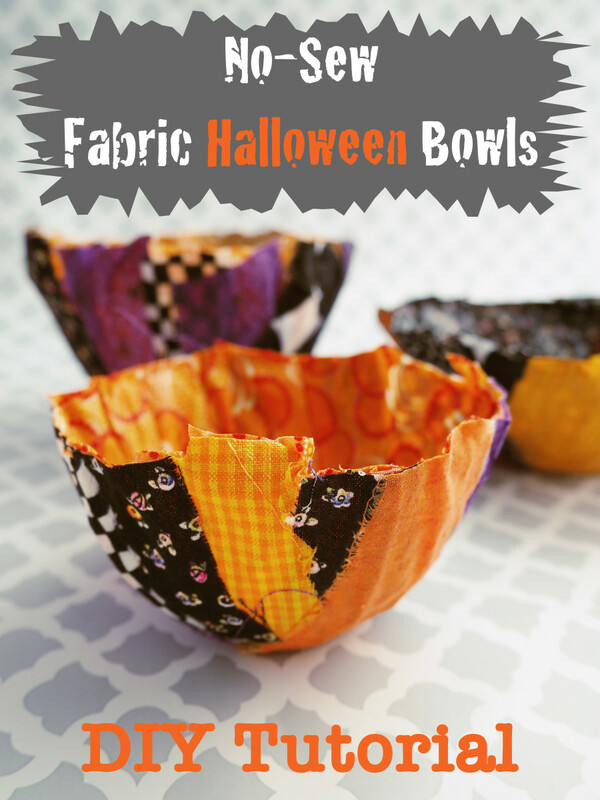 By using a larger balloon, or one of those long, skinny ones, you could make some pretty interesting bowls! What a great way to recycle and this looks so much fun, I can't wait to try it - brilliant thank you and voted up! Thank you! I'm glad you like it and thanks for taking the time to comment to let me know. You have found a great way to eliminate waste and recycle and be creative too.I love it.All new to me what a great thing for kids to do. What a great comment to find first thing in the morning! Thank you, Helena Ricketts! 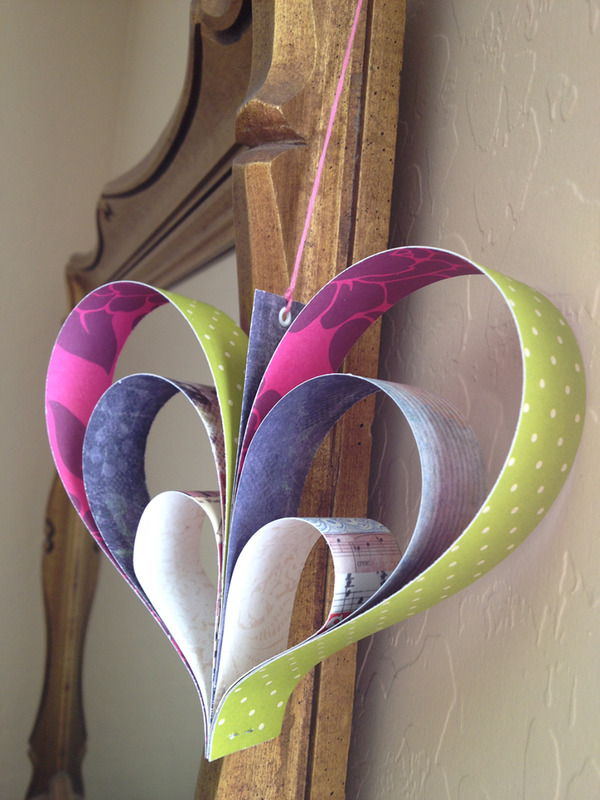 I'm always trying to come up with ways to make recycled crafts, too. I love this idea! I'm always on the lookout for recycling projects like this. VERY neat! Thank you! I have even more recycled magazine projects lined up - now I just have to find the time to make them! I love this idea. Very creative! Beautifully done! Thanks for the great tutorial. Thanks! Yeah, it is easy to get too many magazines and catalogs. My roommates are moving back to their home states soon and I've been watching them cart arm load's of magazines to the trash. I've been tempted to snag some of them, but I still have paper strips left over from this project! Natasha, this is an awesome idea, especially for so many of us who have, you know, that or those stacks of magazines we keep thinking we might need (instead of just clipping out that article or recipe!). This would be great for kids to do too. And it's kind of artsy. Thumbs up and thank you! Thank you so much, Prasetio. It took me a really long time to find my creative streak, and now I love sharing it with everyone. Very inspiring hub. My friend, you are very creative. Thanks for writing and share with us. Rated up and useful! Thanks everyone! I appreciate the shares from ishwaryaa2 and PracticalMommy. Caren Kreftor - thanks for the complements. I know you write about crafty things, so I appreciate it! Vinaya - your candid comment made me laugh! Riverfish - you're right, ads would work really well. I actually cut up some glossy ad fliers, but then decided to go for a monochromatic look. Stephaniebcrosby and emilybee - thanks so much for stopping by and taking the time to comment. I get so excited when I see that little green comment bubble pop up! 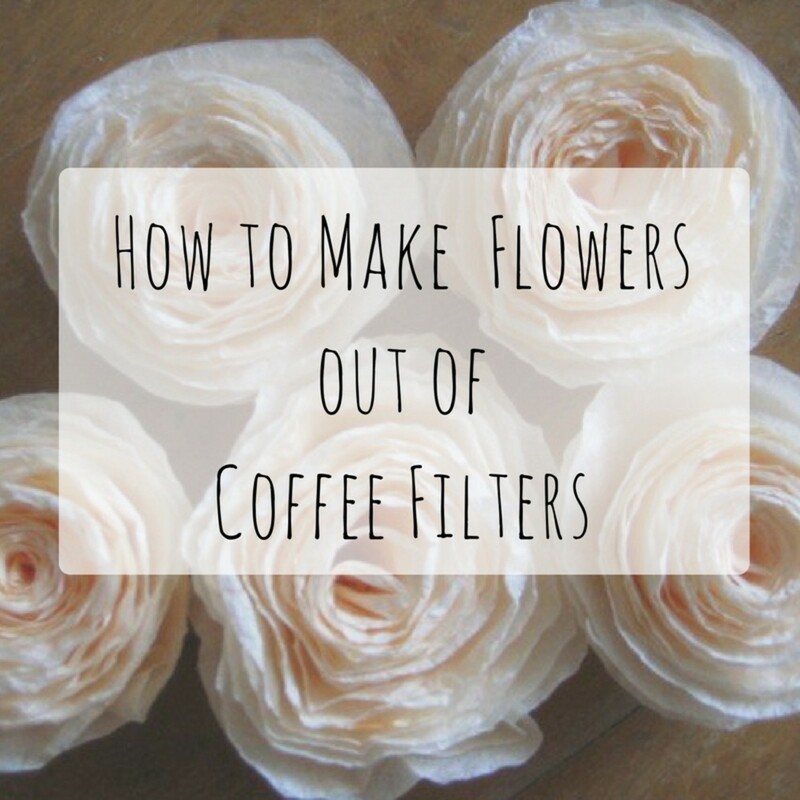 Though this is not my cup of tea, many people will find this tutorial very useful. Thank you for such a clear tutorial...my family will be getting a set of bowls each for Christmas I think hehe. Creatively smart and economical idea! The instructions explained by you are so detailed and the pics are helpful. Well-done! This is a super cool idea. You have saved my life. My recycle can was always overflowing with all the magazines and journals I subscribe to. Now I have a way to recycle that will also help with keeping things organized. Thanks for sharing! Thanks for stopping by, theraggededge. I love this! Just the sort of thing I like to make. Thanks very much for sharing this project. Awesome! Just be prepared to wash your hands a lot - unless you find a way to be far neater than I was. At least white glue cleans easily! What a fun and creative project. Now I know what to do with all these magazines I have sitting around collecting dust. Love this idea. Another great hub! Easy to follow given the instructions and photos. Voted up and useful! Thanks for stopping by, Teaches. I really like the bright yellows and blues - I was lucky to get my hands on these at work! 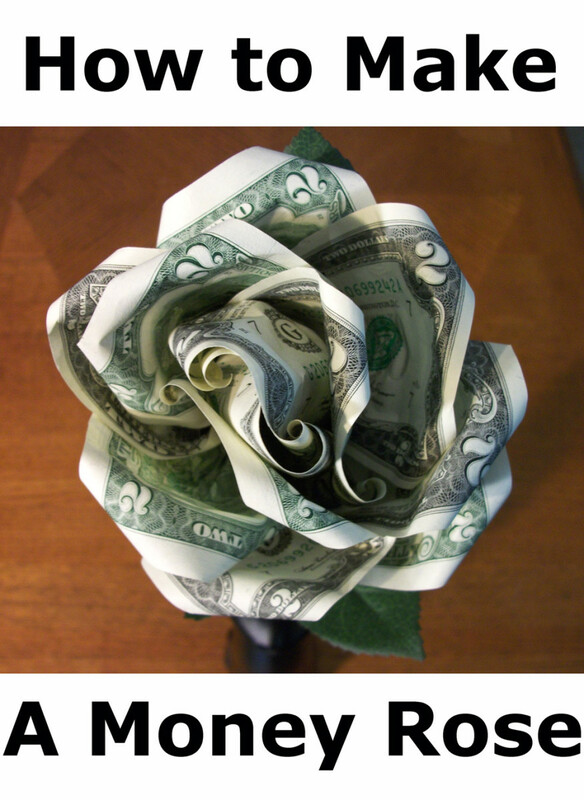 Who would ever think that you could make something so beautiful from paper? Love your idea and also the green tip on saving trees! Thanks for stopping by, HawaiiHeart and TripleAMom. I'm always exited to see new comments! I hope to make many more DIY tutorials because I love making things. What a cool idea! It's great to find new uses for old magazines! This looks like a fun idea my daughter would enjoy trying. She is always looking for something new to create and we have lots of magazines thanks to my mother in law :). Voting up and looking forward to following you to get more ideas. That's a cute idea! Voted up, useful, and shared. DS Duby - Thank you for stopping by and commenting! I'm glad you liked it. Really creative and original idea, I can honestly say I have never heard of something like this. Great hub. LaThing - you probably could use a bowl. The only problem is you might have trouble with coils falling off while trying to dry. You could probably keep that from happening by using super glue, but I found the super glue was really messy to work with. Or, if you let the base of the bowl dry, you could flip the bowl right side up and then build the coils up. That might help. Cheds - thanks for stopping by! Glad you like the recycled craft. Oh, this is such a nice idea, and great way to have the whole family help. Have to try it out.... I wonder if we can use an upside down bowl instead of the balloon. Voting it up, and very useful. Wow - thanks for the quick feedback! I'm glad you like it. Sometimes I feel like I have way too many pictures (I actually took a couple photos out of this one), but I want to make sure the direction are clear.